If you want all eyes on you this Halloween you’ve come to the right place. 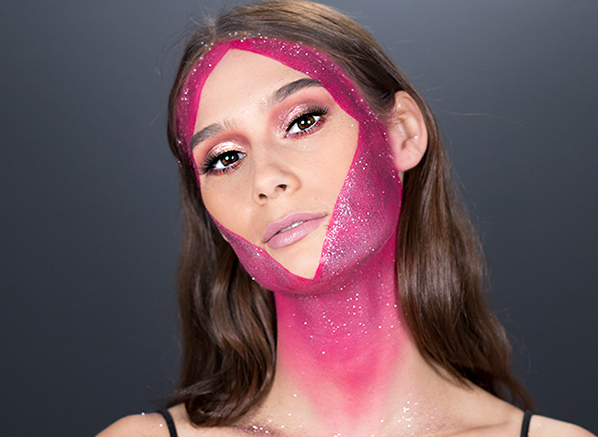 Our vibrant glitter mask makeup look is destined to make you sparkle in the spotlight. 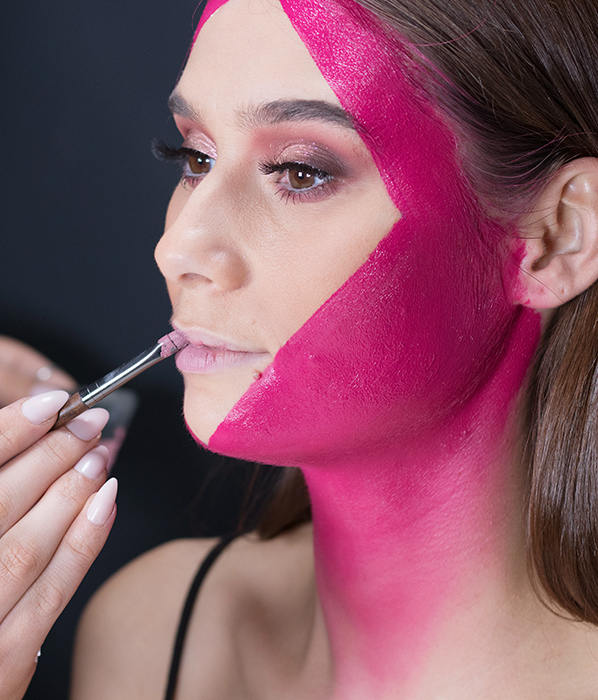 Whether you’re dressing up as an out of this world alien, want to channel the neon 80s, or just want an excuse to get creative with colour, this step by step tutorial will give you all the makeup ideas you need to ensure that your 2018 Halloween look is always remembered. 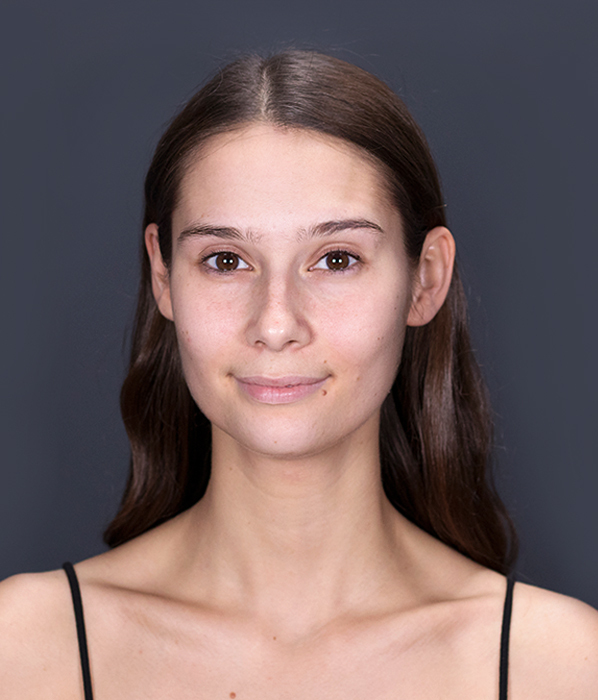 Before starting this makeup look you’ll need to do your base. First blur skin with the MAKE UP FOR EVER Step 1 Skin Equalizer Smoothing Primer, this lightweight formula is great for improving makeup longevity. Next, even the complexion with the Benefit Hello Happy Foundation, this medium coverage base will give the skin beautiful radiance. Then, finish up with a little Laura Geller The Real Deal Concealer where needed and a dusting of the DHC Coenzyme Q10 Face Powder. Up first in this look is the eyes! To begin apply ‘Feelz’, a soft dusty rose matte shade from the Urban Decay Naked Cherry Eyeshadow Palette as your transition colour. 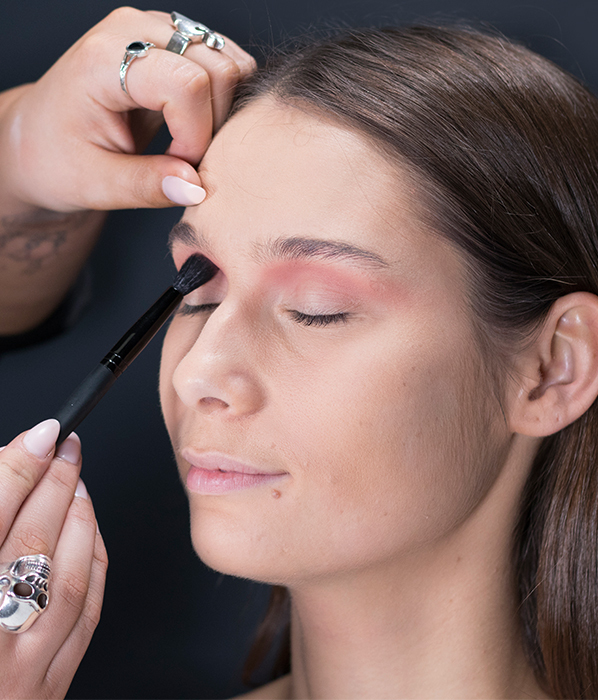 Apply this shade through the crease and blend it upwards toward the brow bone using the MAKE UP FOR EVER Highlighter Brush Small 140. Once you’re happy that your transition colour is completely blended out move onto defining the crease. 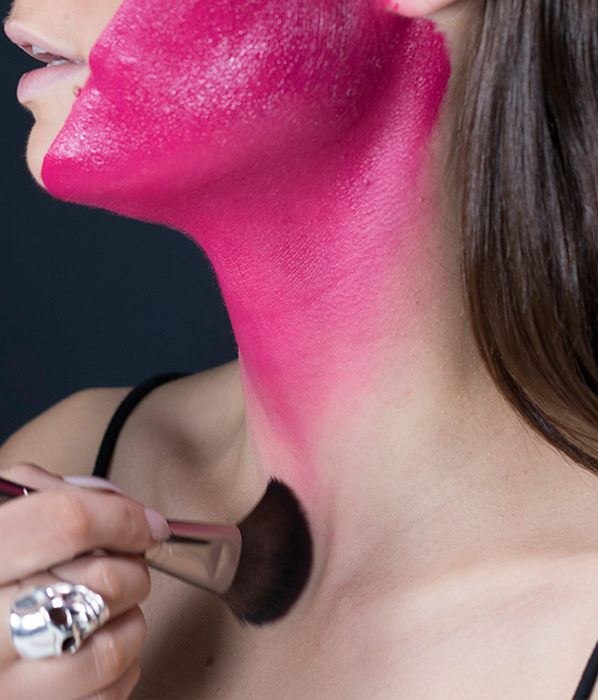 To do this, use ‘Devilish’, a reddish plum shade from the Cherry Palette and the slim-line bareMinerals The Blending Brush. Sweep the brush through the crease and blend upwards to create a haze of colour. Now, it’s time to take things to the dark side. 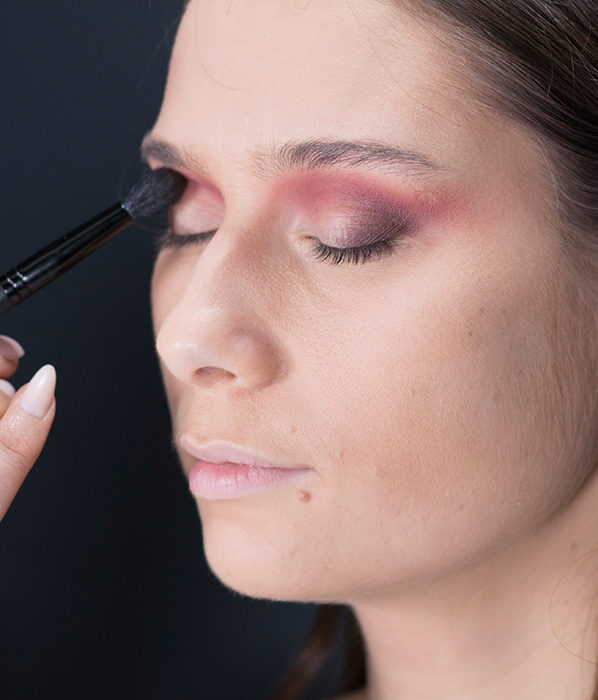 Apply ‘Privacy’, a matte plum brown from the Cherry Palette to the outer corner of the eye using the The Blender Brush. Once packed on, blend out the eyeshadow until its seamlessly merged into your crease colour. 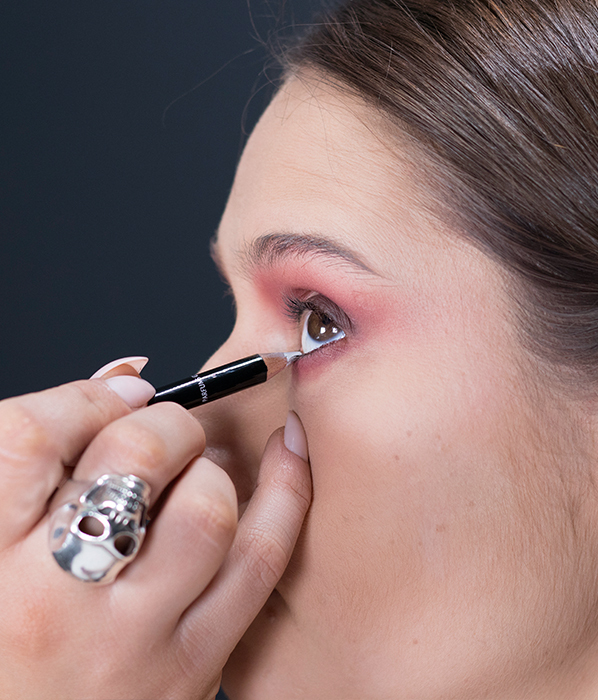 Next apply ‘Devilish’, the shade used in step 2 to the lower lash line, from the inner to the outer corner. The MAKE UP FOR EVER Round Shader Brush Small 210 is a great choice for this application as it’s short, densely packed hairs will enhance pigment, as well as help to create a smoked out blend. To draw even more attention to the eyes apply the GIVENCHY Magic Kohl Eye Liner Pencil in 02 to the lower waterline. Its bright white pigment will open the eyes and make them appear bigger. For extra dimension, apply the Urban Decay Liquid Moondust Cream Eyeshadow in ‘Recharge’ to the inner corner of the eye to create a multi-faceted finish. 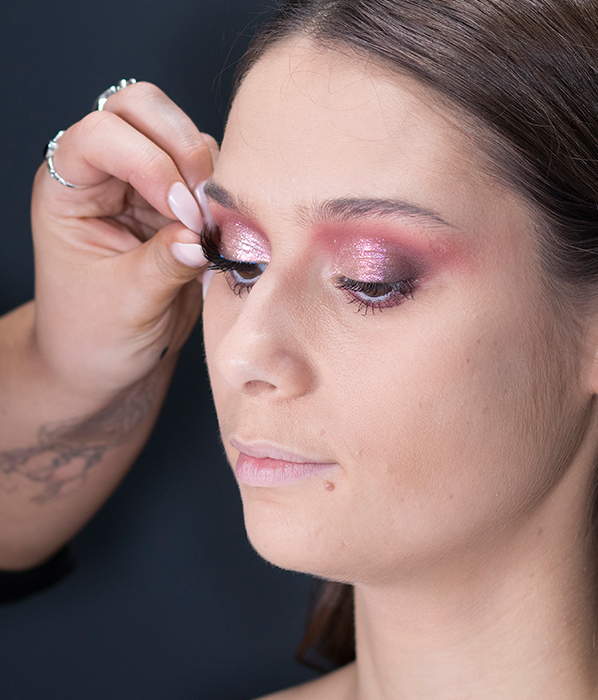 This glittering eyeshadow is a statement rose gold a pink shift and has a brush applicator included for easy application. 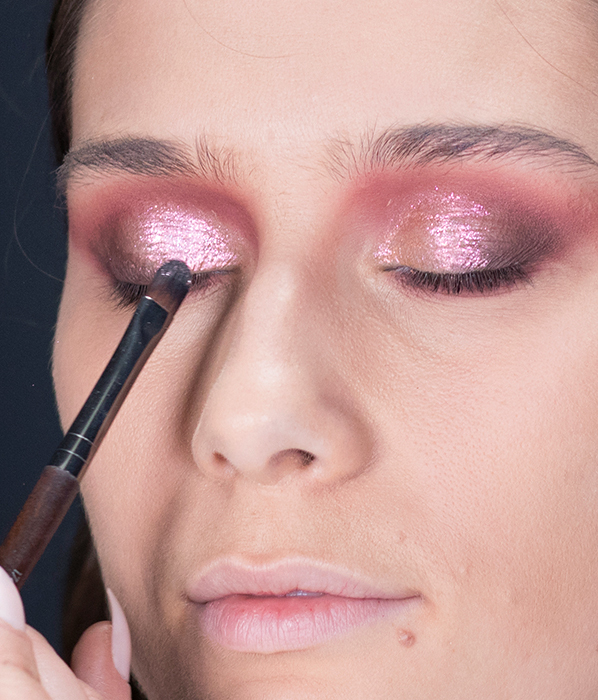 Because one element of glitter is never enough, apply the Urban Decay Moondust Eyeshadow in ‘Glitter Rock’ over the top of ‘Recharge’, (applied above) to really make the eyes pop. ‘Glitter Rock’ is an intergalactic purple with pink and silver flecks throughout – its pigment is intense and it catches the light beautifully! The ideal brush choice for this application is the MAKE UP FOR EVER Concealer Brush Small 174 it has small straight fibres that’ll allow you to pack on pigment. Finish the eyes with a slick of DHC Perfect Pro Double Protection Mascara and the Benefit Real False Lashes in ‘Girly Up Lash’. Thick and impactful without distracting from your eye makeup, these lashes give natural definition and are really comfortable to wear. For best results trim lashes to fit the eye by holding the band against the lash line to measure. Keep the brows super fluffy with Benefit Goof Proof Brow Pencil in shade 5. Start at the arch and take it through to the tail so all the attention is focused on framing your beautiful eye look. 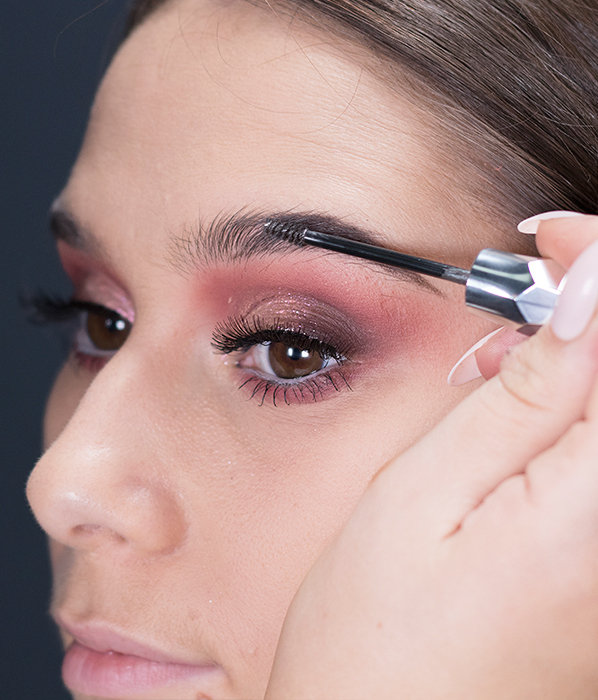 To lock your in brows in place, comb through with the Benefit Gimme Brow+ Volumising Eyebrow Gel also in shade 5. Now, we’re moving onto creating the diamond mask. 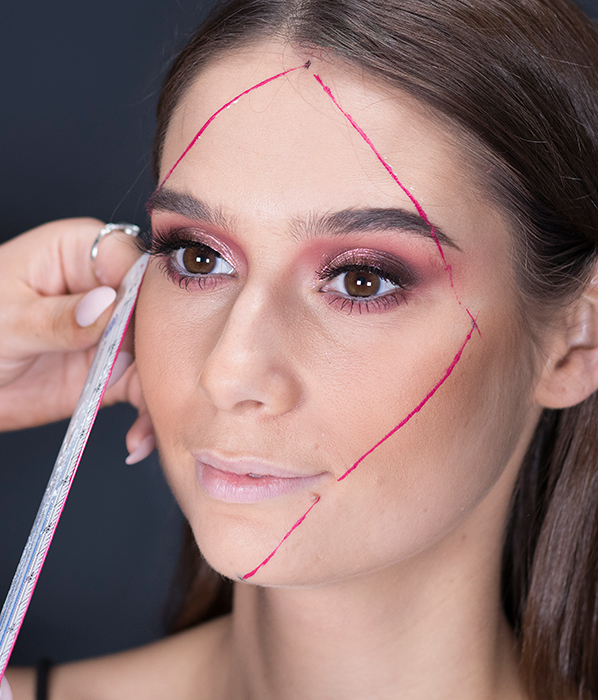 Start by measuring the points of the face: from the middle of the forehead the centre of the ear and from the centre of the ear to the middle of the chin. 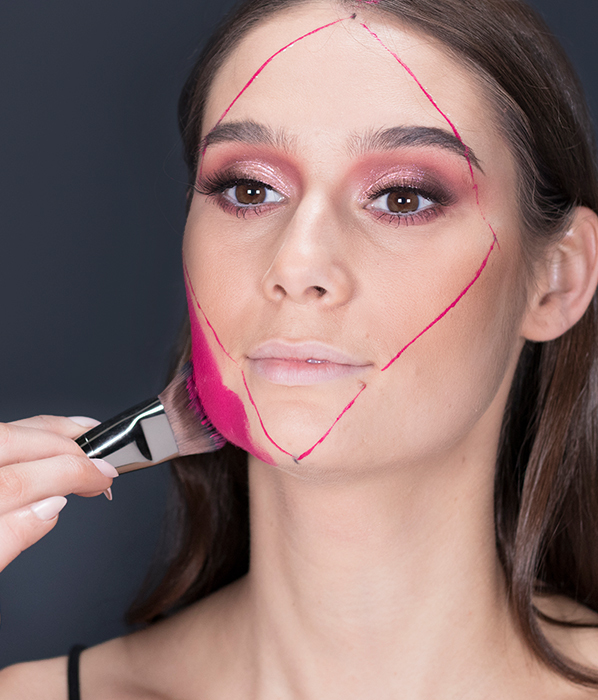 Mark each point using eyeliner, then use a ruler to create the lines of your mask. Then, it’s time for the fun part. Mix the pink, blue and red shades from the MAKE UP FOR EVER 12 Flash Colour Case to create the vivacious shade of pink seen above and apply with MAKE UP FOR EVER Foundation Brush – Large – 108. For extra wow factor, take this galactic pink down the neck. Remember to blend out the edges with a clean, fluffy brush for a soft, diffused finish. To make sure your eyes are the statement, keep the lip neutral but in the same colour palette. Mix the brown, coral and white from the 12 Flash Colour Case to create creamy but comfortable colour that emphasises the eye look. 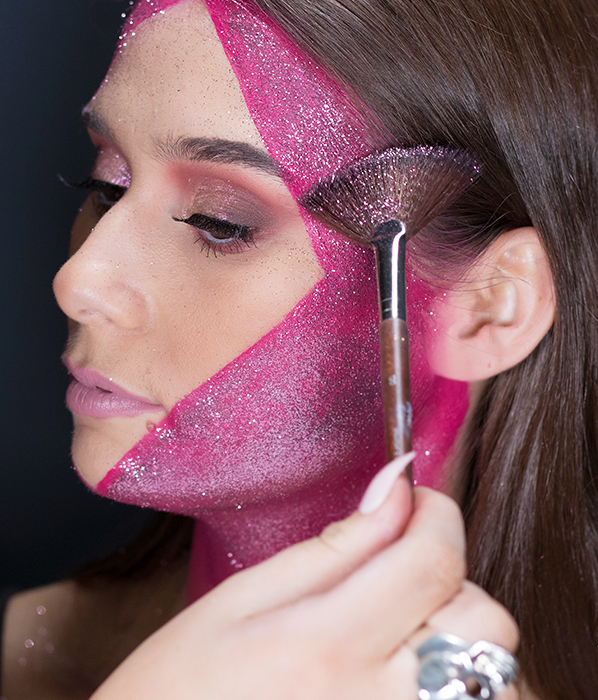 To take this look up a notch, apply the MAKE UP FOR EVER Star Lit Glitter in S806 Champagne Rose to the mask area using a fan brush. The grease paint’s sticky but long-lasting texture makes the perfect base for this look. Dust over the collar bones and wherever you please to become a glittering goddess! We all know how tricky glitter can be! To remove this look, start by decanting the La Roche-Posay Respectissime Waterproof Eye Make-Up Remover onto a cotton pad, (these DHC Silky Cotton Pads won’t snag on glitter), and then gently rub over your eyes and glitter mask. Once you’ve removed the majority of the greasepaint, use the Bioderma Sensibio H2O micellar water to remove any leftover traces of product. A picture almost doesn’t do this look justice. 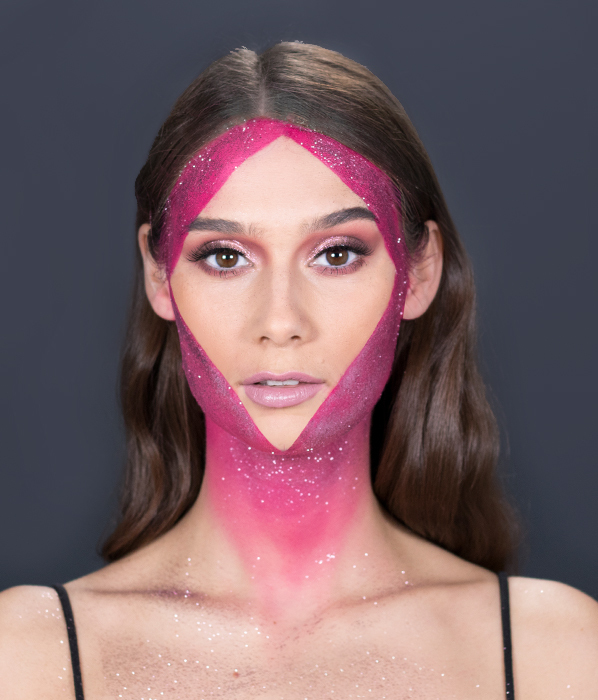 From the spellbinding eyes and striking pink pigment to the jaw-dropping glitter, it’s a Halloween look that has major impact! If you decide to give the glitter mask a go this Halloween don’t forget to tag us on Twitter, Facebook and Instagram using the hashtag #HauntCouture, we’d love to see your creations! This entry was posted on Monday, October 22nd, 2018 at 9:42 am and is filed under Get the Look, Halloween, Hints & Tips, Make-up, Trends, Tried & Tested. You can follow any responses to this entry through the RSS 2.0 feed. You can skip to the end and leave a response. Pinging is currently not allowed.